These Lotus Flower Leis are a must have accessory for any luau or tropical themed gathering. Leis are roughly 36″ around and come in assorted colors. A Luau In Full Bloom. A Lotus Flower Lei will add some colorful fun to your Hawaiian themed party. These flower accessories are perfect for luaus, Hawaiian themed events, summer celebrations, boat parties, and Mardi Gras fun! These are sure to be a hit wherever you are. Leis are approximately 36 inches from end to end. Flowers are made of comfortable-to-wear silk and are approximately 3¼” in diameter. Assorted colors that you cannot choose; sorry! Small plastic tubing protects string for a longer, more durable wear. 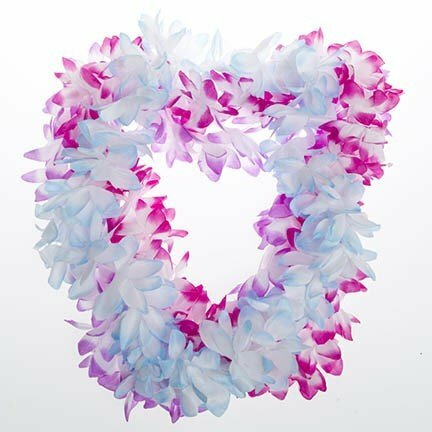 These are the best leis we offer and they always go quickly whenever we have them in stock.